The Yokosuka E1Y was a Japanese floatplane of the 1920s. 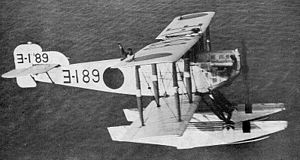 A single-engined biplane that was designed and developed by the Yokosuka Naval Air Technical Arsenal as a reconnaissance aircraft for the Imperial Japanese Navy, 320 were built as the Type 14 Reconnaissance Seaplane, entering service in 1925 and remained in operational service until 1932. In 1921, the Japanese Naval Arsenal at Yokosuka started design of a single-engined reconnaissance floatplane to replace the Navy's Yokosuka Ro-go Ko-gata floatplanes. The resulting aircraft, the Type 10 Reconnaissance Seaplane was designed by a team led by a member of a visiting delegation from Short Brothers of the United Kingdom. It was a single-engined two-bay, two-seat biplane powered by a 400 hp (298 kW) Lorraine-Dietrich engine. Two were completed in 1923, but showed poor performance due to being overweight. A modified aircraft, the Type 10 Model A flew in 1924, showing only slight improvement, while a further revised prototype, the Model B flew in 1925, this curing the aircraft's weight problems while demonstrating better stability and control. As a result, several pre-production Type Bs were built. Although the Type 10 was not adopted by the Japanese Navy, it was again redesigned, reducing the wingspan from 16.16 m (53 ft 0� in) to 13.99 m (45 ft 11 in) and reducing the empty weight from 1,912 kg (4,215 lb) to 1,660 kg (3,659 lb). In this form, the revised design was accepted in January 1926 as the Type 14 Reconnaissance Seaplane, later receiving the short designation E1Y. Two versions entered service in 1926, a two-seater powered by a 400 hp (300 kW) Lorraine-Dietrich 1 V-12 engine, the Type 14-1 or E1Y1, and a three-seater with all-metal floats and a more powerful Lorraine-Dietrich 2 W engine. In 1928, the Type 14-2 was used as the basis for the Type 90-3 Reconnaissance Seaplane, of which about 20 were built as the Yokosuka E5Y1 and Kawanishi E5K1. As the Type 90-3 showed little improvement over the Type 14-2 from which it was developed, in 1931, Yokosuka developed the further refined Type 14-3 Reconnaissance aircraft, with a new tail, a geared Lorraine-Dietrich 3 engine and significantly improved performance. A total of 218 E1Y1 and E1Y2s were built by Yokosuka (23), Nakajima Aircraft Company (47) and Aichi (148). 102 E1Y3s were built by Aichi. The E1Y1 and E1Y2 entered service in 1926, replacing Yokosuka Ro-Go Ko-Gata and Hansa-Brandenburg W.33 seaplanes, with the E1Y3 following them into service from 1931. The E1Ys formed the main reconnaissance seaplane equipment of the fleet, operating from Battleships and seaplane tenders. E1Ys were operated from the seaplane tender Notoro during the Shanghai Incident of early 1932. The E1Y remained in use until the early part of the Second Sino-Japanese War. Many E1Ys were sold as civil aircraft from 1932, usually converted with a cabin for three or four passengers. Some were fitted with Napier Lion engines. Prototype reconnaissance seaplane, powered by 400 hp (298 kW) Lorraine-Dietrich 1 V-12 engine but overweight. Two built. Further modified prototype and pre-production aircraft. Initial production version, powered by 400 hp (298 kW) Lorraine-Dietrich 1. Modified version, with new all metal floats and 450 hp (336 kW) Lorraine-Dietrich 2 W-engine. Further improved version with new tail and improved performance. The type number was the year of the Taishō Emperor's reign, i.e. Type 10 = 1921. Donald, David (ed.). The Encyclopedia of World Aircraft. Leicester, UK: Blitz Editions, 1997. ISBN 1-85605-375-X. Mikesh, Robert and Abe, Shorzoe. Japanese Aircraft, 1910-1941. London: Putnam & Company Ltd., 1990. ISBN 0-85177-840-2.